Winamp for Android is the media player for Android devices. The Winamp for Android has been designed to provide high quality media player, complete media management solution and ability to sync Winamp desktop library from desktop to Android devices. Moreover, it also supports iTunes library import and access to thousands of internet radio stations with SHOUTcast. Download and stream free music. Move iTunes library to Android. Playlist and play queue management for Android. 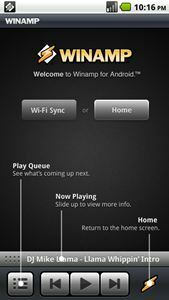 Syncs Winamp desktop library to Android devices. Additional artist info including News. Album art gesturing for track change. Integration with Android’s “listen to” Voice Action. Wireless desktop sync (Winamp 5.6 required). Fixed crash issue on Sony Ericsson Xperia series. Add new Languages including Dutch, Italian, Spanish and Turkish. The Winamp for Android version 1.0.1 is now available for free download at Android Market. The Android media player works well in Android 2.1 operating systems and above.